At first glance, it seems that everything related to the curatorial duo from Italy is slightly vague and draped in mystery – beginning with their name, Francesco Urbano Ragazzi. As anyone who has the slightest knowledge of Italian may expect, their name implies that there is more than one Ragazzo in this team. 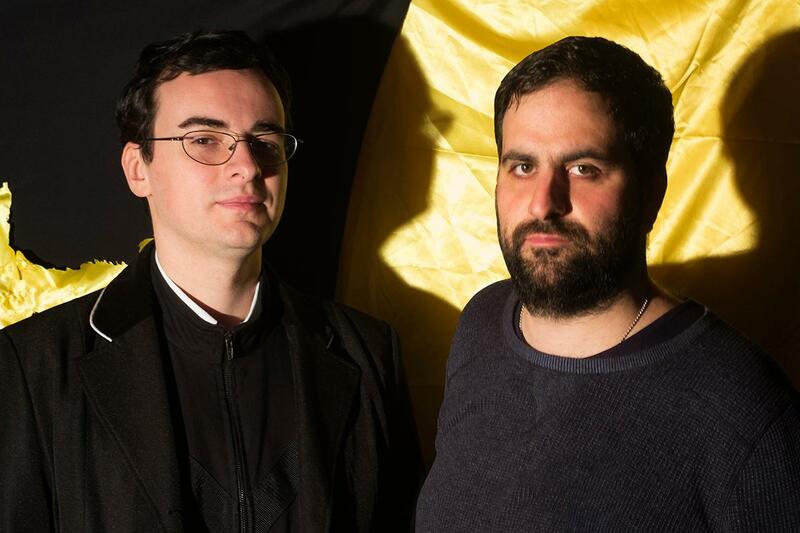 Nonetheless, the duo’s moniker is actually a very simple coinage, premised on the curators’ real names, Francesco Ragazzi and Francesco Urbano. The second veil of enigma emerges when the two actually refer to themselves as an “it”, in some of the official statements they make, making the audience perceive the collective as a unified instance, a single stream of thought. Finally, when it comes to the subject matter that Francesco Urbano Ragazzi deal(s) with, we truly come to realize that it is the aura, and not the material evidence, that affects the show (whether curated by two curators or a mysterious plural – it doesn’t matter). And this dichotomy we find in much of their work. 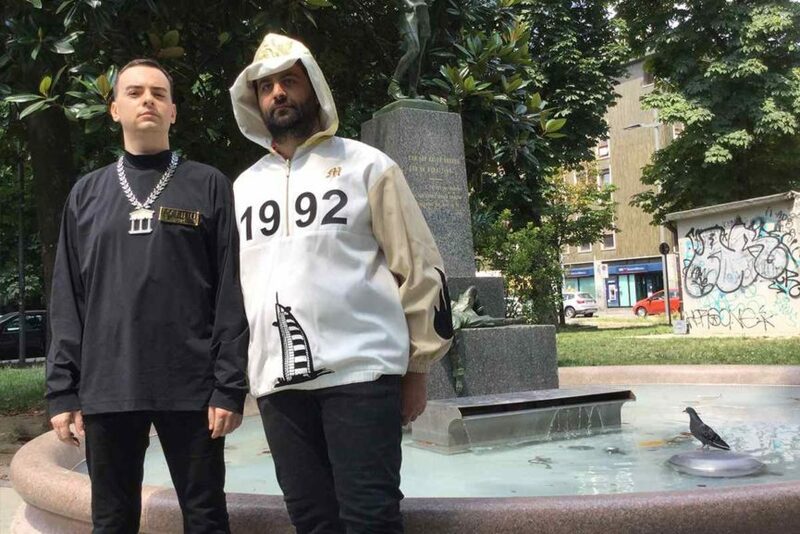 The two have been active as a duo since 2005, sharing a deep interest in the “Internet-born artistic and cultural models, gender studies and the emerging artistic scenes“. All of the aforesaid is assessed from a multitude of vantage points in their shows, constantly pushing the limits and uncovering new layers of each, addressing the aesthetical, the political, the material and the immaterial. With The Mystical Staircase still “on view”, some great exhibitions and Venice Biennale collaborations behind and an interesting artist-in-residence program completed just recently, Francesco Urbano Ragazzi speak openly about their ideas and endeavors in this interview. Francesco Urbano Ragazzi – The Church Of The Unconnected, 3rd Internet Pavilion for the 55th Venice Biennale. Miltos Manetas – Outside of the Internet there is no Glory, 2013. Photo by Matilde Cerruti Quara. WideWalls: It is safe to say that your curatorial practice has been shaped by the Internet and the Post Internet phenomena. How would you describe the significance of the Internet in today’s art, both in terms of its conception and realization? FFUR: The Internet is the very revolution of our life. Art, curating and all the rest are just consequences. Watching art through screens is not such a big change and surely is not the point: the entire history of painting is based on it, on the translation of 3d into 2d. There has to be something more. Our first interest has been in anthropology, in how the culture of connection is changing the human mind, body and feeling. In 2013 we curated the 3rd Internet Pavilion on the occasion of the Venice Biennale. 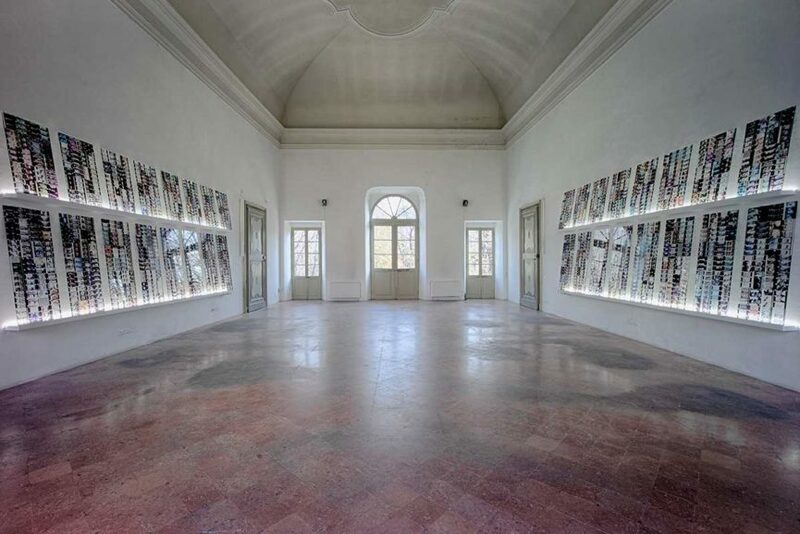 Miltos Manetas’ solo show was called “The Church of the Unconnected” and located in a consecrated chapel in the Dorsoduro neighborhood. We dedicated it to those people who hadn’t experienced the Internet yet, more than 50% of the world population at that time. The Unconnected were our patron saints, embodying a way of memorizing, researching, orienting and relating which is rapidly disappearing. The web is their meteorite. Talking more specifically about art, something that really thrills us is the way the Internet is challenging the ontology of artworks. 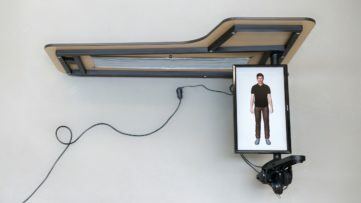 Artie Vierkant started saying it well with his Image-Object theory back in 2010: between the web and reality many artworks lose their unity becoming fluid, multiform entities. Nelson Goodman or Richard Wollheim have become unusable. And now we know that Walter Benjamin was wrong too. Artworks are not losing their aura, it’s the aura that is getting rid of artworks. WideWalls: When it comes to exhibiting, do you see the Internet as a new type of environment, or as another element that adds to the overall experience lived by the spectators? FFUR: The Internet itself is an environment: we can live there and make online exhibitions. But the overlapping, the parallelness that happens when coding affects our life or the “real world” seems totally rendered is much more interesting. There are at least two Internets anyway. There is an Internet which is fighting to defeat all dichotomies between real and virtual, between genres, between genders, between cultures. And there is an Internet which is just restoring the old values of Modernism. Look at the Greenbergian flatness of a painting posted on Instagram. Look at the dazzling whiteness of white cubes in the exhibition views appearing on almost every contemporary art blog or platform. WideWalls: Your latest exhibition, A Mystical Staircase, is imagined as an online-curated show, virtually hosted by the “cloud” and accessible by everyone. However, it is associated with a particular venue, 63rd – 77th Steps. Would you care to explain this? FFUR: On the one hand ‘mystical staircase’ is the name for an allegory describing the ascension to Knowledge. Its iconography, a ladder suspended in the sky, is the archetype of all initiatic paths in the Mediterranean region and still resonates in Wittgenstein’s Tractatus Logico-Philosophicus. Tarots are also designed to represent the progression of a mystical staircase: you start from The Fool and you end up to The World. On the other hand 63rd – 77th Steps is an art space dedicated to online experimentation which is located on a staircase somewhere in Bari. Its founder wanted to have us as guest curators. We thought it might have been a good match to make a show in the form of a tarot deck there. We invited 24 artists of different generations and backgrounds asking each one to design a card for a new deck. But you are right: this exhibition has been made to be experienced everywhere. Indeed, we presented A Mystical Staircase at Villa Croce Contemporary Art Museum in Genova and we will present it at Komplot in Brussels. The first two steps in a series of oracular lecture-performances. 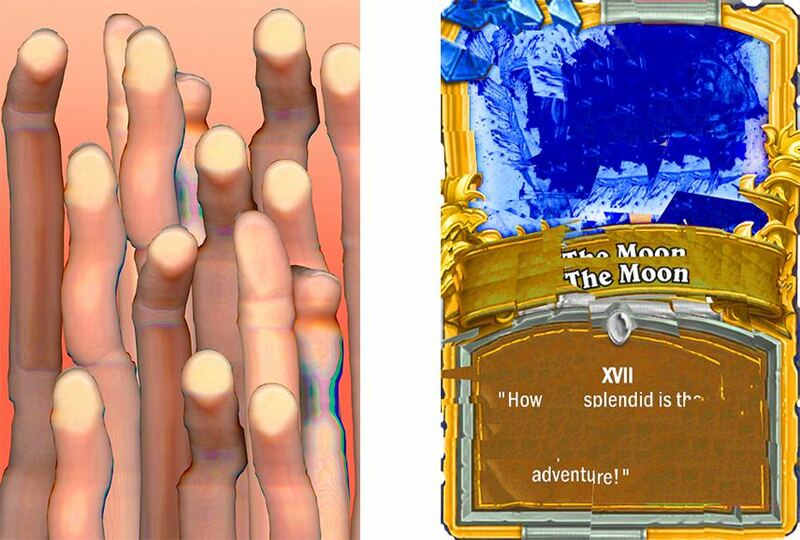 WideWalls: Why did the exhibition take the shape of a virtual tarot card deck? What is the mystery equivalent to, in this case? FFUR: Chance is a fundamental element of A Mystical Staircase. When you visit the show online, you need to ask your question and pick a card from a virtual deck to see only one artwork at a time, which will also be your answer. Then, if you decide to go back to the main page and give it another try, the deck reshuffles. You never know, by consequence, what card is going to appear on your screen next. It’s the artwork that chooses the visitor and talks to them. The linearity of traditional exhibitions is overcome, and a more personal kind of attention is activated. The deck is never wrong, but your understanding only depends on how much you believe in art and technology. WideWalls: In one of our previous conversations, you mentioned that the vertical video format was also an important part of A Mystical Staircase project. Is this only a matter of aesthetics, or does it relate to another discourse? FFUR: We might look at vertical videos just as something induced by the design of smatphones and tablets. As you know, nowadays it is the most rapid and mimetic way of filming. Its diffusion is more and more relevant to visual culture and has been consecrated not only by Snapchat and Vimeo, which adapted their aspect ratio options according to their users’ needs, but also by some episodes in recent history. Recep Tayyip Erdoğan spoke on TV via a vertical video during the recent coup d’etat in Turkey, and activist Arthur Reed took a vertical video to testify the shooting of Alton Sterling in Baton Rouge. In curating A Mystical Staircase, we wanted instead to look at this rotation of the camera as a revolution in the recording and composition of moving images: what we called Vertical Cinema! Along the exhibition you’ll find some inspiring examples made by Sarah Abu Abdallah, Eva Papamargariti, Kareem Lotfy, Tabita Rezaire, Basma Alsharif, Chiara Fumai, FAKA, Luca Pozzi, Johanna Bruckner, Brent Watanabe, Malibu 1992 and Institute for New Feeling. We have very important predecessors though, such as Tacita Dean’s Film presented at Tate Modern for the Unilever Series in 2011. Vertical Cinema is only partially a matter of aesthetics. We think it testifies the rapprochement between moving images and writing since verticality, which once belonged only to pages, now belongs also to filming. 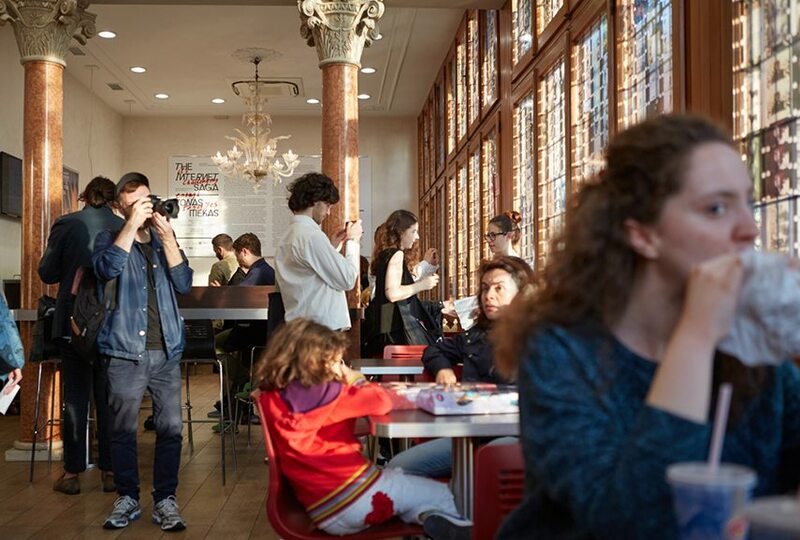 WideWalls: From my personal assessment, it seems that your Internet Saga exhibition, which was a solo show by Jonas Mekas taking place in a Burger King in Venice, translated a sense of the presence of the immaterial from an online experience onto a “real-life” situation. The life of the exhibition coexisted with the generic atmosphere of a fast food restaurant, occupying the same space, and yet being completely independent. Is this a physical metaphor for the way Internet gains its own autonomy? FFUR: Exactly. The point is autonomy! Jonas Mekas is the icon of Independent Cinema who is leading us to the era of Autonomy. Palazzo Foscari Contarini, where The Internet Saga has been initiated, isn’t just a fast food restaurant though. It also is a XV century building equipped with Murano chandeliers, marble columns and bas-reliefs. So, when the project was inaugurated there during the 56th Venice Biennale, three levels of historicity suddenly overlapped. Late-Renaissance, Modernity and Contemporary: the time clash we all have experienced browsing the Internet. The exhibition is only a layer, since we decided not to add any object inside or outside of the building. Jonas Mekas’ artworks were somehow hacking the space: the sound piece To Petrarca was loudly diffused in the courtyard, the windows were covered with transparencies representing 768 frames from Jonas’ films, three new editings from his Online Diary were shown on the screens which usually broadcasted MTV all day long. The Internet Saga almost didn’t touch Palazzo Foscari Contarini as if it were a parallel dimension, but changed the nature and perception of the building. In order to understand the relationship between the show, the fast food and the palazzo, you have to consider our visitors and their different degrees of engagement. We had the art-aware people on one side and the burger eaters on the other. Both groups had purposes which equally legitimised them to stay in the space, but most of the time they were ignoring the counterpart as if they were invisible to each other. This behaviour can be called “interpassivity”, and it probably belongs to the web more than interactivity, which is just an ideology. We don’t see interpassivity in apocalyptic terms anyway. It is a possibility for digital asceticism, a pause which leaves space for infinite and unpredictable combinations in the accident of the real. 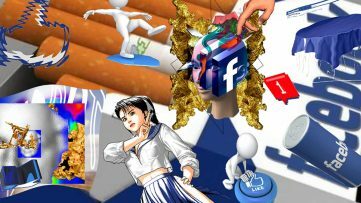 WideWalls: Is the Internet, as a subject and a motive, becoming exhausted nowadays? Do you think we’ve speculated on it for long enough, or is there still something left to say? FFUR: Art is always late! Think about it: the first biennial in Europe to approach this universe was held in Berlin this year. Finally the curators faced the topic systematically and the change in language was huge, in Europe at least. We see three possibilities to take the discourse further. One. Searching for the roots of digital culture outside of post-internet and even outside of the Internet, as we did inviting Jonas Mekas to exhibit in Venice. The daily relationship he had with his Bolex anticipated our own relationship with smartphone cameras; the launch of his online diary in 2006, only a few months after YouTube was launched, was just the natural consequence of the poetical, diaristic approach to filming he has adopted since the 60s. Two. Seeing if the comeback of virtual realities, which are based on an immersive perception of space, will affect or even defeat the many timelines of our lives. Three. Looking at what is happening on other Internets. What is it like, for instance, to be an artist using QQ, the most popular program for instant messaging in China? What is it like to use Instagram for dating in the Gulf region? 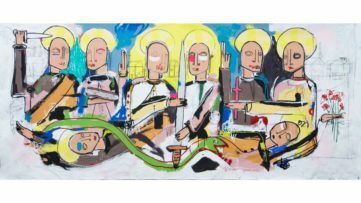 WideWalls: What is next for Francesco Urbano Ragazzi? FFUR: Now we are curating a new residency program in Milan as part of an exchange between FARE and the Maraya Art Centre (Sharjah). The artist we selected, Jumairy, is a not so prodigal son of Gulf Futurism who lives between Dubai and the digital world. This dimension, which brings a non-western territorialization to the Internet, strongly inspires us. We would like to create a long term residency platform dedicated to the discovery of these Internets. Then we will go ahead with a screening series. We want to develop some ideas about the relationship between the New American Cinema group and a new generation of artists dealing with moving images today. But we are also working on an institutional painting exhibition dedicated to the artist Patrick Angus who died almost unknown in 1992. We’ll keep you updated! Featured images: Francesco Urbano Ragazzi, photo by Alessandro Di Giampietro; Francesco Urbano Ragazzi styled by Malibu 1992; Jonas Mekas – in an instant it all came back to me, installation view at Apalazzo Gallery, 2016. Photo by Alessandro Speccher. All images courtesy of Francesco Urbano Ragazzi.